Gotham Girls Roller Derby Win the 2014 WFTDA Championships! Gotham Girls Roller Derby defeated Rose City Rollers to become the 2014 WFTDA Champions for the fourth year in a row, and fifth time over all. Bay Area Derby Girls came in third place. Detroit Derby Girls won the Division 2 Championship, with Rideau Valley Roller Girls coming in second, and Bear City Roller Derby placing third. If you can’t make it to the tournament in person, you can still follow all the action live on WFTDA.tv! 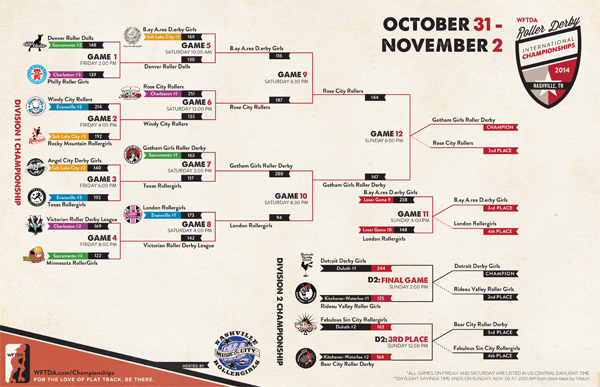 Relive all of the amazing action from 2014 WFTDA Playoffs in the free WFTDA.tv Archives.